Sun Lakes is a community located in Maricopa County, Arizona. It has a population of 13,975 residents and rests on 5.2 square miles of land. Sun Lakes is an active adult golf community filled with many amenities perfect for those looking to retire and enjoy having fun. It provides a resort vacation lifestyle and is equipped with many gated communities. Sun Lakes has five country club communities. There are several 18 and 9-hole golf courses, restaurants, heated pools, hot tubs, driving ranges, tennis courts, health clubs, arts and crafts centers, billiards, stocked fishing lakes, and many miles of walking paths. There are many housing options available for future residents. The median home value is $272,500. The home value rate has risen by 4.8% in the past year and it’s predicted to rise by another 3.7% in the coming year. 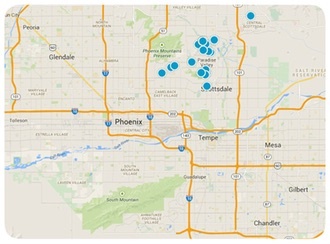 The median price per square foot is $140 and this is higher than Phoenix Metro’s median of $124. If you are interested in purchasing a home in Sun Lakes, contact us today for more information.